A Super GT in GTA San Andreas. The Super GT is a sports car in Grand Theft Auto: San Andreas, but it takes the form of a supercar in Grand Theft Auto IV. In GTA San Andreas, the Super GT is based on a 1993 Mitsubishi 3000GT with the back of a 1993-2002 Toyota Supra. The Super GT can be modified at TransFender garages. There are also two versions of this car; a hardtop and a targa top. As San Andreas is set in 1992, the base models are anachronistic by a year, but this could explain its high price and rarity. A Super GT in GTA IV (Rear quarter view; engine). 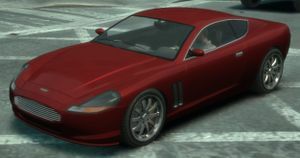 In GTA IV, the Super GT (branded as a Dewbauchee car, although police radio chatter erroneously refers to it as a Pfister) is an amalgamation of various sports cars: the front and side profiles appear to share design cues from both a modern Aston Martin DB9, or an Aston Martin DBS and a Maserati GranTurismo, while the rear fascia resembles that of a Ferrari 612 Scaglietti, Mitsuoka Orochi, and a Ferrari 550 Maranello; the side vents appear to be from a 2005 Land Rover Range Rover Supercharged. The Super GT has a turbocharged V8 engine, contrary to the V12 engines used by the Aston Martin DB9 and DBS. The Super GT lacks an external radio antenna. The Super GT is also available with differing hood designs, either featuring a relatively smooth hood, or one with a low U-shaped ridge. The interior features black leather and carpeting with bucket sports seats. The center console is finished in aluminum trim and features an analog timepiece. The Super GT also features a gated 5-speed shifter. The F620 in The Ballad of Gay Tony shares several similarities to the Super GT. The Massacro in Grand Theft Auto V, based on a 2012—present Aston Martin Vanquish, is a spiritual successor to the Super GT, as the Aston Martin Vanquish is a successor to the DBS and DB9. The Super GT has a top notch speed and acceleration, but its downside is that even when driving in low speeds, turning can cause wild fishtailing, even more so when driving in higher speeds. The Super GT's collision durability isn't that good either. Therefore, the player should use caution while driving the car and turn slow and gently. Stepping off the gas will also help. If the back starts sliding out of control, let off the gas and slightly turn to the opposite direction. In GTA IV, the Super GT is among one of the fastest cars in the game with a top speed is 211 mph (340 km/h) - even faster than most Aston Martins in real life, and the acceleration and speed of the Super GT are superior to many other cars in the game. The distinct sound of a turbocharger can be heard at higher RPMs, which separates it from the other supercars. The Super GT is an excellent choice for its speed and for its brakes, which are powerful and don't lock up very easily. Also, because of its high horsepower to torque ratio, the car can easily be slid into a drift by a single tap of the E-Brake (at moderate enough speeds); making the Super GT a great choice for drifting. The car's rank in performance is pushed further back with the introduction of faster sport cars in subsequent Episodes of Liberty City DLC. The Super GT is central to the final test for the Driving School, in which the player must use the car to drive to the other end of San Fierro and back. Completing the Driving School with Bronze or better will award the player with a maroon Super GT that will constantly spawn in front of the school. During a car chase in one of Bernie Crane's missions, the Russian criminals drive a Super GT, while the character most likely drives a Turismo, as it is the car parked in front of Bernie's house. At the climax of the mission, the Russians hit a curb and crash their car, forcing you to get out of your Turismo and take them out on foot. Once they are dealt with you can steal the Super GT for yourself and save it. For its paintjob, it has a deep metallic version of one of five colors: gray, blue, red, green, or pink, all of which are unique. It may or may not come with a hood ridge. Another Super GT is also obtainable outside in the mission "Trespass", being located at the main entrance of the abandoned Sprunk factory where you must find and kill Chubby Charlie. However if you complete the mission, and do not collect the car, it will disappear. As a part of text message car missions from Stevie, he will ask you to procure one parked in front of the "69 Exchange" in The Exchange, Algonquin. Before taking it to Stevie's garage, save it in one of your parking spots and wait for another to re-spawn. Then take the re-spawn to Stevie. Alternate Super GT badges on a pre-release Super GT in a GTA IV television program, removed before GTA IV's released. Ironically, in GTA San Andreas it appears as a Mitsubishi 3000GT, whereas the Alpha is designed after the American version, a Dodge Stealth. So in general it is the same car but with different regional designs. The Super GT is also one of the most expensive cars to import in GTA San Andreas together with the Bullet and the Cheetah, cashing in at $84,000. However, the player is awarded $105,000 when he exports the car in mint condition. Due to a programmer error, the PC version of the GTA San Andreas Super GT lacks a sheen. The Super GT in GTA San Andreas strangely features a horn found on more large trucks and/or cars such as the Cabbie. 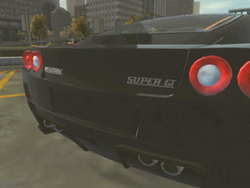 An earlier form of the Super GT in GTA IV features "Super GT" and "Asstone" badges in the rear. In its final form, however, only a Dewbauchee emblem is present in place. The Super GT in GTA IV lacks license plates. After collecting all thirty cars for Stevie in GTA IV, a Super GT may be sold at his garage for $11,000. It is ironic when upon close inspection the Super GT in GTA IV shares the engine cosmetics with the Stratum, although the Stratum appears to have an air filter and a turbocharger fitted. The Super GT is one of the three most expensive cars in GTA IV, the others being the Turismo and the Infernus. The Russian Mafia in GTA IV occasionally uses Super GT in missions, such as is the case during "Union Drive" and "Trespass". The Bullet GT replaces the Super GT in The Ballad of Gay Tony's multiplayer Race/GTA Race modes. The BradyGames guide for Episodes From Liberty City mistakenly refers to the Super GT as a new vehicle in EFLC. The Super GT and Turismo are the only sports cars in GTA IV to not appear in GTA V.
Spawns while driving a Perennial in Rodeo, Los Santos on Fridays, and from a PCJ-600 (Wednesday). Outside the Driving School in Doherty, San Fierro after achieving bronze for all the challenges, constantly appearing with a maroon body. Behind the control tower at Easter Bay Airport, San Fierro. It may occasionally be locked. Parked at the Royal Casino Auto Bahn outlet in Las Venturas, when a Super GT is requested for export. May occasionally come equipped with an alarm. Importable from Easter Basin docks in San Fierro for $84,000 after completing export lists. Spawns on The Strip, Las Venturas. The requested Super GT in Stevie's Car Thefts. Can be found on the street next to the Bank of Liberty in The Exchange, Algonquin, for Stevie's Car Thefts. Can be found around Star Junction and The Triangle, Algonquin, Liberty City. Obtainable during the Bernie Crane mission Union Drive, and can spawn parked in front of the Sprunk Factory in Alderney during the Phil Bell mission Trespass. If you compete in Brucie Kibbutz's races early on, it is likely that you will see it in at least one of them. You can kill the driver and steal it but you will cancel the race and your favor with Brucie will go down 3 percent. Spawns in traffic in Multiplayer in GTA IV. Can be spawned by dialing (227)-555-0168 on your phone. This does not affect any achievements. Massacro, the spiritual successor to the Super GT in Grand Theft Auto V.
This page was last modified on 17 July 2015, at 04:07.